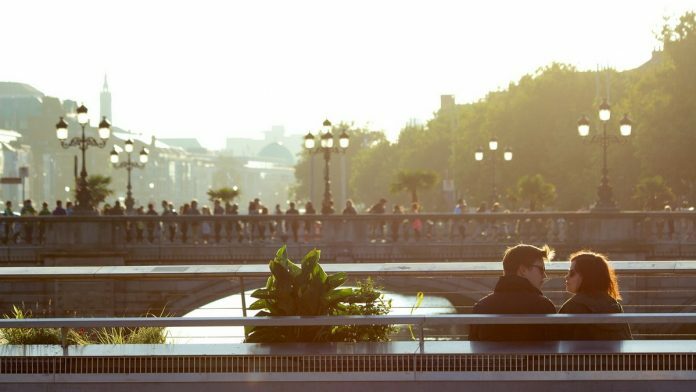 Go through this cheat sheet to plan a date any time of day, and (almost) anywhere. If you’re going out on the weekend: Kick off your adventures on and along the Miami River, starting with a mile-long, manatee-spotting walk around the Brickell Key loop. Then it’s off for a scenic history lesson at Miami Circle Park, where you can explore what remains of a 2,000-year-old settlement at the confluence of the Miami River and Biscayne Bay. Use Boatsetter (it’s like Airbnb for sailing) to charter a small yacht for the rest of the weekend—and head straight to Luijo Island. It’s tiny, accessible only by boat, and offers a great view of the Miami skyline; conveniently, you’ll be just downstream from Greek hotspot Kiki on the River, where it’s de rigueur to sit outside for a late, languid lunch of lavraki (sea bass) and tomato salad. From there, Fisher Island is your last stop: The 1920s cottages that make up its glitzy Island Club resort are tucked right next to a marina, making them a convenient and plush landing pad for a pampering weekend (not too far) away. If you want one great night: First, book one of the 11 ultra-spacious suites at the Bulgari Hotel, a renovated 18th-century Milanese palazzo hidden down a private street in central Milan. Since you’ll be right above the luxury shopping outlets that line Via Montenapoleone and Via della Spiga, pick up something nice to wear at Massimo Alba and then go see conductor Marc Albrecht lead the orchestra at the city’s great opera house, Teatro alla Scala, a five-minute walk down the street. Or stop into Pinacoteca, housed in the elegant Palazzo Brera, where you can see masterpieces of Italian painting in an intimate setting. Either way, you’ll want to eat at Il Ristorante back at the hotel. Helmed by Niko Romito, who’s earned three Michelin stars at his remote Reale restaurant, this spot features what he calls “recodified” versions of the classics, from lasagna to veal Milanese and—of course—tiramisù. If you want one great night: Pay homage to the holiday with a stroll to the Whitefriar Street Church in Dublin’s city center—the remains of St. Valentine, patron saint of lovers, are said to be in a wooden box tied with a red ribbon in a casket beneath a marble altar. Then continue walking on a tree-lined path in St. Stephen’s Green before warming up to afternoon tea at the grand Shelbourne Dublin. Decide if you want a pre-dinner pint in the 120-year-old Grogans Castle Lounge, beloved among the city’s bohemian set. Then it’s a quick cab ride to Ross Lewis’s Michelin-starred Chapter One, which highlights such local ingredients as Irish Guinea hen with white pudding. If you want a weekend getaway: Hop on the city’s DART train service and scoot out to Howth, a small fishing village just north of the city. There, grab a hot chocolate to go in any of the town’s cute cafes and head up to the cliff walk, a six-mile loop overlooking Dublin Bay. The Summit Inn bar, set in a 19th century cottage, is a perfect pit-stop for a pint of Guinness—and it’s worth sticking around for an early charcuterie-and-cheese dinner at the House, once home to Captain William Bligh of Mutiny on the Bounty fame. Sleep it off at the new boutique Devlin Hotel back in Dublin: The cozy Americana Bar has a strong selection of Irish whiskey, and the corned beef and scallion hash at breakfast comes with panoramic city views, to boot. If you want a weekend getaway: Your getaway to Quebec’s Eastern townships, near the Vermont border, starts with a 75-minute drive to Balnea Spa. Soak in hot baths outdoors—with your hat on, Quebec style!—while admiring the snowy landscapes at your now-warm fingertips. The spa’s peaceful restaurant, Lumami, offers a vegetable-focused menu, or you can continue on to Manoir Hovey, a lakefront Relais & Chateaux property with fireplaces in most of its 36 rooms and access to 30 acres of woods and gardens. For Valentine’s Day weekend, the hotel is offering an eight-course menu of Arctic char and quail, which will give you the stamina for a weekend full of snowshoeing, skating on the lake, or even dogsledding with your significant other. Reported by Nikki Ekstein, Dara Doyle, Kurumi Mori, Siegfrid Alegado, Nathan Crooks, Kate Krader, James Gaddy, James Tarmy, Hannah Elliott, Josh Friedman, Christopher Palmeri, Sandrine Rastello, Peter Martin and Renee Bonorchis.